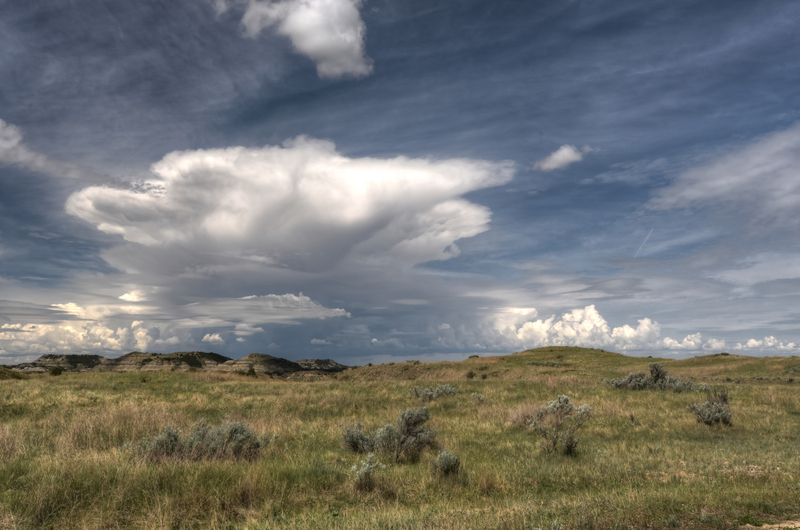 Growing up, Theodore Roosevelt National Park was the park next door. I grew up in eastern North Dakota, a relatively short drive from the park. I moved away from North Dakota when I was 23, before my love of the national parks really took hold so I never took advantage of that proximity. Now, I try to visit whenever I’m back home visiting family. I have vivid childhood memories of Medora, a gateway town to the park, and I thought the rest would come back to me once I started driving around. In fact, the opposite happened. Once I drove into the main landscape of the park, I realized that I had not been there before. It is definitely something I would have remembered. 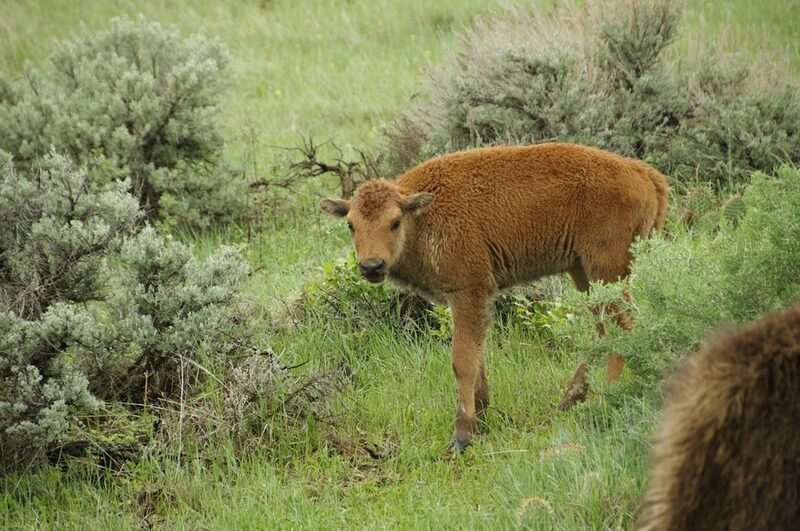 The rugged landscape, the wild bison and horses, and the scenic overlooks were all fresh and exciting. I’ve now made two visits to the park. On both trips, I visited the South Unit of the park, but on my second trip, I finally made it to the more remote North Unit. 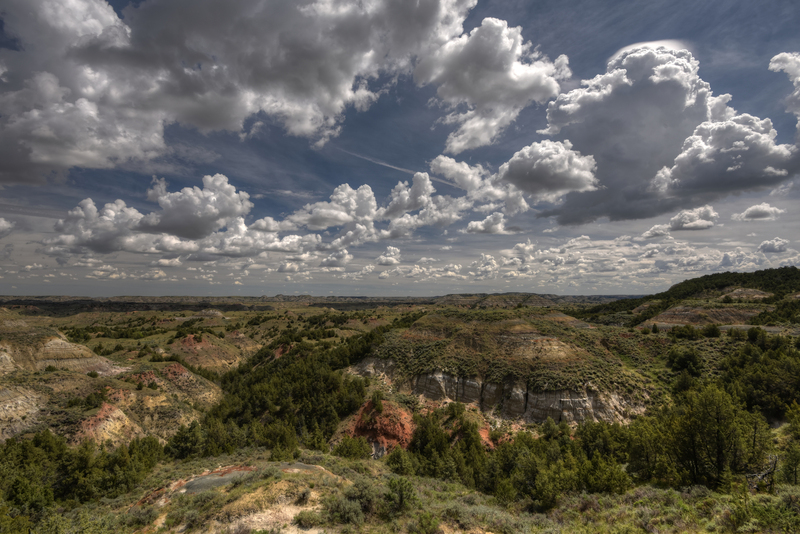 Theodore Roosevelt National Park is broken into North and South Units about an hour drive apart. I spent my time in the more popular southern unit. I didn’t take any hikes, but I drove the aptly named Scenic Loop Drive and spent quite a bit of time at Buck Hill and the Boicourt Overlook. Park visitorship in May is about 1/3 of what it is at the peak in July. That was certainly the case when I visited. Both times I visited, it was the end of May. Thinking back to it now, I can only remember seeing a handful of cars on the roads and a few people at Buck Hill. For the most part, I felt like I had the park to myself. Having grown up in North Dakota, I am no stranger to how fickle the weather can be. I started my trip at my mom’s house in Bismarck, ND and spent three days hanging out inside hoping that the rain would let up. During both of my visits to the park, it rained. But each time, the clouds opened up to reveal a beautiful sunrise or sunset. I flew into Bismarck which is a short two-hour drive from the park. Medora sits right at the entrance to the park. Both times I visited the park, I stayed at the AmericInn in Medora. Medora is a full-fledged tourist trap, but it’s a decent place. As I mentioned in the intro, I have fond memories of the place; talking my mom into buying me a dreamcatcher at a giftshop and going to the Medora Musical. I ate lunch at a small diner along the main drag in Medora. There are plenty of those around. I bought some groceries in Bismarck so had some of those for dinner and the continental breakfast at the hotel. Theodore Roosevelt was my second stop on a grand loop around North and South Dakota that would eventually bring me to Mount Rushmore, Wind Cave National Park, and the Badlands, before flying back home. I spent about as much time driving on this trip as I spent in Theodore Roosevelt. This trip taught me a lot about broad vs. deep experiences. I saw a lot on this trip but only got a superficial sense of each place. Now that I have a feel for Theodore Roosevelt, I’m certain that I will go back in search of a deeper experience. I woke up before dawn at my mom’s house in Mandan, ND and set off quickly. The drive goes fairly quickly; the speed limit is 75 mph, the road is straight as an arrow, and the drive itself is about two hours. On top of that, the Mountain Time Zone starts just west of Mandan, so in an hour of nominal time, I was driving into Medora. I stopped at overlooks like Skyline Vista, but it was drizzling and my lens kept getting wet so I mainly looked around. 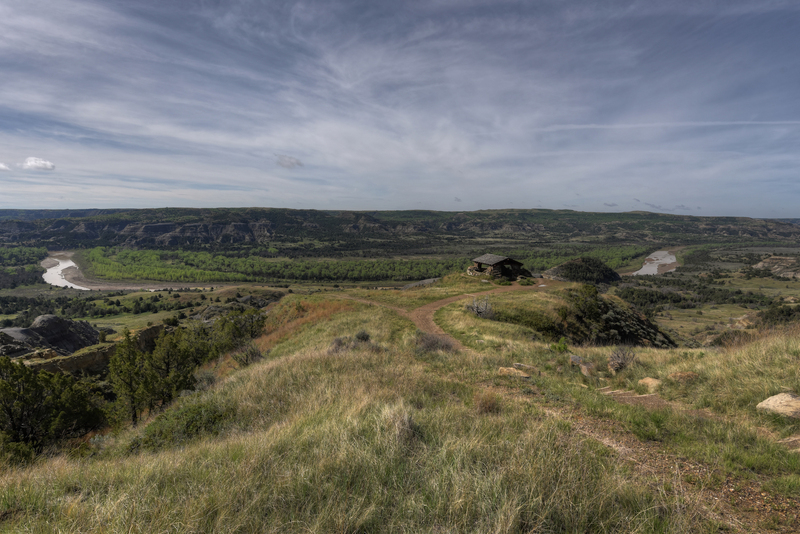 My first planned destination was the pullouts that overlook the Little Missouri River. I had seen some nice pictures from these vantage points while researching the park. Unfortunately, the entire stretch of the road that parallels the river was under construction so I had to follow a chase car and wasn’t allowed to stop. This got me to the north side of the South Unit and I turned onto Scenic Loop Drive. Immediately, I started seeing herds of bison off the road. There weren’t any pullouts and there were no other people at that time of the morning, so I stopped in the road and took pictures out of my window. I didn’t get many usable pictures here either, but it was awesome to see wild, though fairly docile, bison. I drove to the Boicourt Overlook and followed a short trail out to a point that had an amazing 270 degree view of the landscape. I decided that this is where I would try for sunset, if the sky cleared up. I continued driving to Buck Hill, another place I’d seen in a number of great park photos. 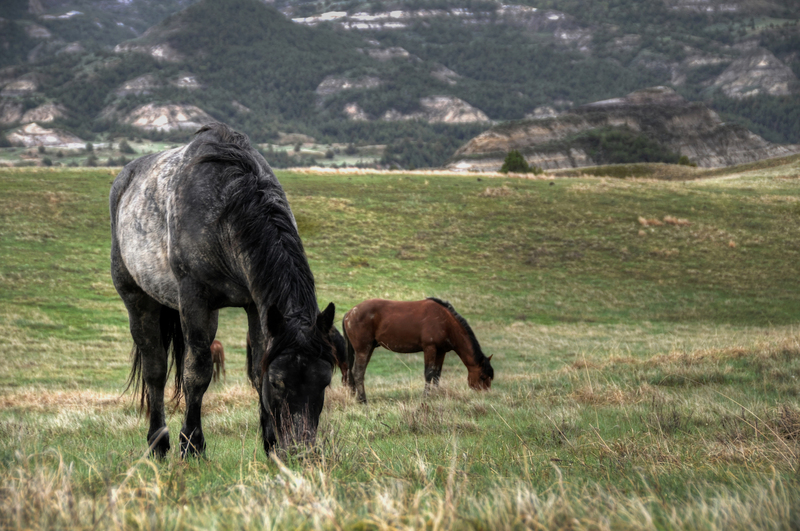 I walked the short distance to the top of the hill and found a number of wild horses. I spent some time trying to frame up different shots of them with the distinctive erosion as a backdrop. Finally, I got tired of the drizzle and headed back to Medora, got some lunch at a small diner, and checked into my hotel. I took a nap and looked through the pictures. After eating some granola bars and fruit for dinner, I headed back into the park, hoping that the clouds that had been constant all day would miraculously part and give me a spectacular sunset. They did not. I spent about an hour on the Boicourt Overlook before packing it in and heading back to the hotel. I didn’t want to leave Theodore Roosevelt empty-handed so I vowed that I would wake up early and head into the park for sunrise. Though I’d been there twice already, I figured the Boicourt Overlook offered me my best shot at a good foreground for any decent sunrise light. It’s quite a long drive from Medora to the Boicourt Overlook. It’s only 16 miles, but with winding roads and slow speed limits in parks, it takes about 40 minutes to make the drive. I arrived with plenty of time and made my way out to the now familiar overlook by headlamp. I had about 40 minutes before the actual sunrise so I moved around to stay warm and continued to think about what compositions I wanted (I had a lot of time to think about this the night before too). I was glad that the clouds were broken and it looked like I would get some decent color. And I certainly did. The sun didn’t come up quite where I thought it would, but the light it cast on the clouds was exactly what I was hoping for. I snapped away as quickly as I could, trying to make the most of the light. In the end, there were only so many unique compositions to be had from that overlook. Once the light had died down, I turned my camera west and tried to take some selfies (one thing I like to do in the parks). 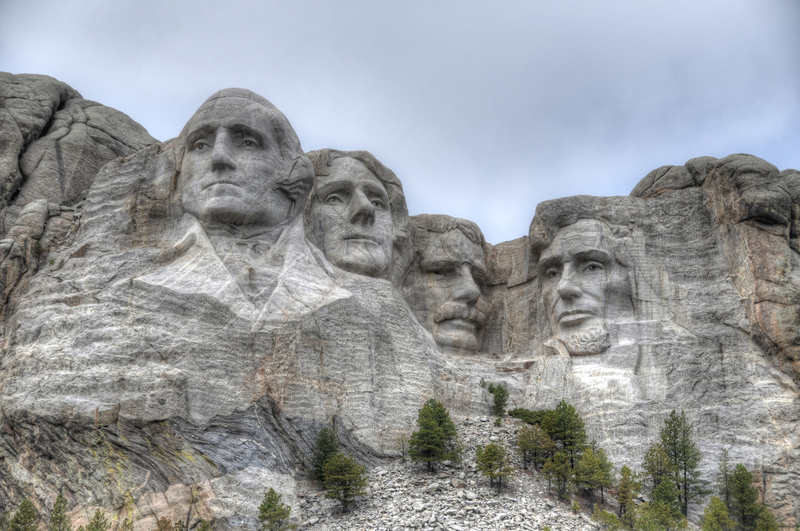 Once I’d done all I could there, I decided I would head back to the hotel so I could eat breakfast and get started on the 5 hour drive to Mount Rushmore. On the way back, I came across a herd of elk. I had my wide-angle lens on and they were a ways off, so I just pulled over and watched them watching me for a while before jumping back in the car. After breakfast, I drove to South Dakota. Even with all the driving, it turned out to be a remarkably busy day. 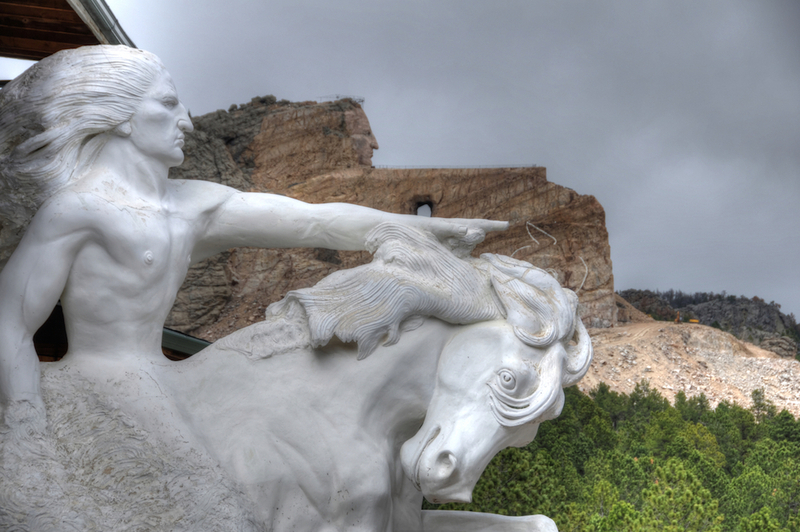 I saw Mount Rushmore (below left), the Crazy Horse Memorial (below right), and Sylvan Lake in Custer State Park. I really wanted to take sunset photos from the overlooks near the Little Missouri River. The construction ruled that out, so that is still something I would like to do. There are a few hikes I would like to make including the Jones Creek Trail and the Petrified Forest Loop Trail. Also, I hope to make it to the park’s North Unit some day. On another trip home to see family, I couldn’t resist the chance to explore the park and try to improve on my previous experience. I drove to the South Unit of the park early one morning, stayed the night in Medora, drove to the North Unit the next morning, and was back in Bismarck by the afternoon. It was a whirlwind trip, but enjoyable. Once again, I started out before sunrise, hoping to squeeze in a full day. I got to the park around 7:30. I hadn’t thought the trip out very well, so I ended up following my game plan from last time. I drove the Scenic Loop road stopping at the Boicourt Overlook and Buck Hill again. This time I didn’t see any wildlife except for a few prairie dogs. I was hoping for more wild horses. Once, I had relived my previous trip, I started to try new things. I walked the short Coal Vein Trail (below right). It was about this time I started to see storm clouds beginning to form. I hurried to the Ridgeline Trail (below left) to get some photos before the rain started. While things looked ominous to the west, the east had magnificent cloud cover. After the Ridgeline Trail, I headed back to Medora for lunch and to check into my hotel. Shortly after that, it started pouring rain. I mean extremely heavy rain with some tiny hail pellets mixed in. I hung out in the hotel for a few hours hoping for the weather to clear and it did around dinner time. While I was driving earlier, I had driven past the Wind Canyon Trail and I knew that’s where I wanted to spend sunset. That was one of my regrets from the first trip. So I drove out there, arriving about 2 hours early. I played around with different compositions and spots along the trail and found a few that I liked. Finally, my patience paid off with a spectacular post-storm sunset. I shot hundreds of photos during the 15-20 minutes that I had this light, including this HDR panorama that’s made up of 30 shots. After that sunset, I decided I didn’t need to try to top it with a sunrise shot. Instead, I slept in a little (until 6:00), had breakfast, and then set out for the North Unit of the park which is about a 1.5 hour drive northeast of the South Unit. I didn’t spend much time in the North Unit…only about 2 hours. I drove the park road all the way to it’s end, stopping at the overlooks on the way in and on the way out. My favorite spots were the River Bend Overlook (see photo to the left), which also overlooks the Little Missouri River, the Bentonitic Overlook, and the Oxbow Overlook at the very end of the road. The landscape was more green in the North Unit. I appreciated that contrast with the dark and rusted colors of the rock formations. It’s remote location also cuts down on the number of visitors. I hardly saw any in the South Unit, but the North Unit seemed eerily abandoned by comparison. I saw one other person during the two hours I was there. I still never went on the long hikes I wanted to. I was intimidated by the storms and once again did not schedule enough time. I barely scratched the surface of the North Unit. I know there’s a lot more there to see. I am excited to get back there. On both of my trips, I spent two half days in the park. When I go next time, I will make sure I have at least one full day so I can slow myself down and enjoy a hike instead of feeling like I need to see everything. Theodore Roosevelt National Park is unique in my park travels so far because the one shot I was most interested in getting was not of a place, but of an animal. I knew there would be plenty of bison on my North and South Dakota trip and, in truth, I was bisoned out by the time it was done. I was most interested in seeing wild horses. I don’t recall ever having seen wild horses before and I’d seen a number of great photos like this one from inside the park. When I saw the horses on Buck Hill, I was so excited. I don’t think I did them justice and the weather conditions didn’t help much, but it was a dream fulfilled as far as I’m concerned. 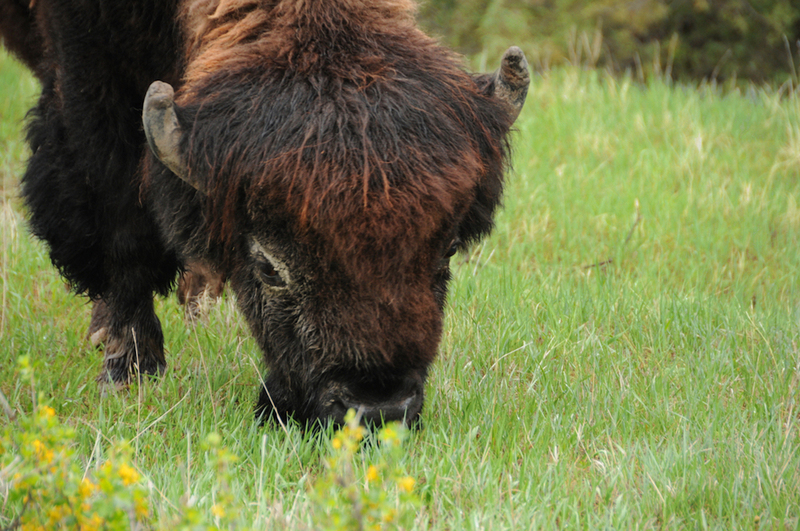 Theodore Roosevelt National Park on NPS.gov – Get information straight from the people who know best. My Theodore Roosevelt National Park Gallery on Flickr – A collection of my photos from this trip on Flickr.